Vocational Rehabilitation offers a solution for employers looking to fill positions in the fastest growing occupation. Everyone should be given an opportunity. You don't know what people can do until you give them a chance. According to a new study by the U.S. Bureau of Labor Statistics, healthcare occupations and industries are expected to add the most jobs between 2014 and 2024. With such a growing demand for healthcare services in the years ahead, healthcare providers may struggle to find qualified applicants to fill their vacant positions. One place those employers should look is to Vocational Rehabilitation (VR), a federal/state agency that helps people with disabilities get or keep jobs. VR provides the training and education needed for people with disabilities to be successful in the most in-demand healthcare careers. Miami native Cristy Segura is among them. 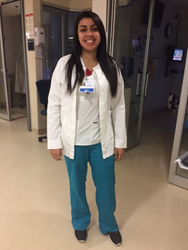 From the time she was young, Cristy knew she wanted to make a career of helping other people, so she dreamed of attending nursing school. When her emotional and learning disabilities made it difficult to pursue that dream, she knew she couldn’t give up; instead, she went to VR to find support. VR helped Cristy make it through nursing school by covering the costs of tuition, books, and necessary accommodations so that she could focus entirely on her education. With VR’s support, she earned her Associate of Science degree at Broward Community College in 2013, and moved on to Florida International University to complete her Bachelor of Science in Nursing in 2015. Cristy is goal minded even in her spare time. When she isn’t working, Cristy attends nursing conventions and has even taken up a hobby that she never expected to enjoy outside of the classroom – reading. “During school, I never thought I would miss those nursing textbooks, but I do,” she admits. Cristy’s success is not only a testament to her own determination, but also a positive example for any employer who might be wary of hiring people with disabilities. “Everyone should be given an opportunity,” says Cristy. “I’m doing well in my job. You don’t know what people can do until you give them a chance.” In the New Year and in years to come, healthcare employers would do well to turn to VR to find qualified applicants ready to go to work.